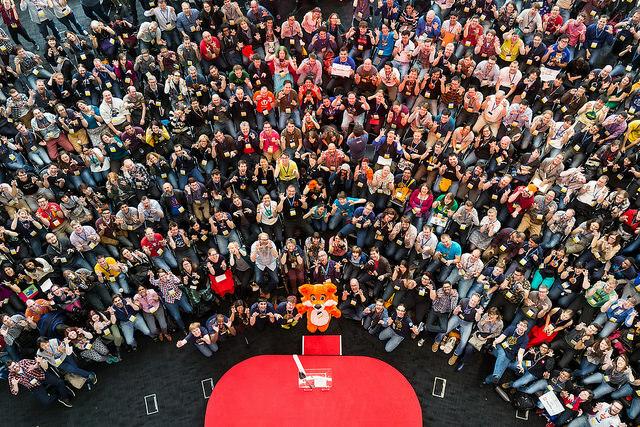 MozFest14. If you know where to look, a mySociety human is in there. Somewhere. We were at the Mozilla Festival again this year. In practice, this meant we had a table at the Friday night Science Fair, ran a session in the Build and Teach the Web track about “Reusable Civic Tech”, and spent a lot of time meeting old friends and making lots of new ones (technically, we call that “networking”). This blog post is a shout-out to all the fabulous people we talked to, demonstrated with, learnt from, and perhaps even drank a cheeky beer with. It was excellent to meet you all. Because we’re based in the UK, we’re especially lucky that the Mozilla Foundation’s annual festival was once again held in London. It’s good for us because our friends from the London Mozilla Space are there, and also because this makes it easy for us to get to (unlike so many of the attendees, we didn’t need to travel all the way into the country first). In fact, the unique and lofty Ravensbourne venue is an excellent location for such an event — it’s easy to see what’s happening on the other floors, and it’s easy to wander up and down between them. There is a lot going on to see and do, and, just like last year, even the stairs are productive: we had some serendipitous encounters on our way between floors. Our primary activity at the festival was spreading the word about the Poplus federation and its reusable civic tech components. If you bumped into any of us, or if what we were demonstrating tickled your fancy, or if you are even now wearing one of the T-shirts we generously gave out: do please remember to get involved!